Yet everything within that cot was wondrous neat and clean. A little worn-out creature, his once bright eyes grown dim. It was a collier's wife and child; they called him "Little Jim." For she had all a mother's heart, had that poor collier's wife. And prays that He will spare her boy, and take herself instead. 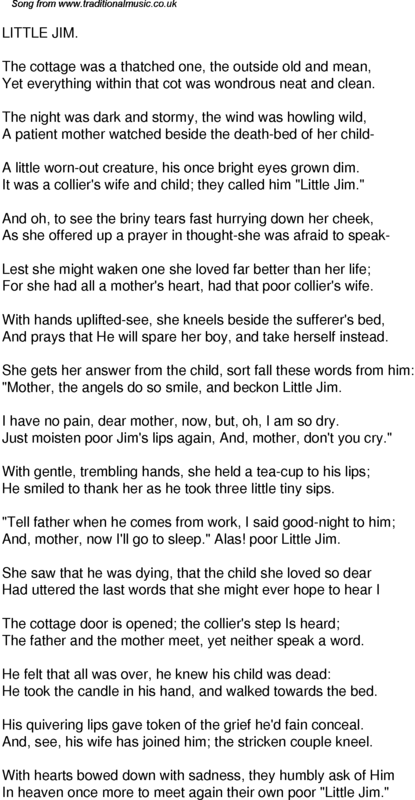 "Mother, the angels do so smile, and beckon Little Jim. I have no pain, dear mother, now, but, oh, I am so dry. Just moisten poor Jim's lips again, And, mother, don't you cry." He smiled to thank her as he took three little tiny sips. And, mother, now I'll go to sleep." Alas! poor Little Jim. The father and the mother meet, yet neither speak a word. He took the candle in his hand, and walked towards the bed. His quivering lips gave token of the grief he'd fain conceal. And, see, his wife has joined him; the stricken couple kneel. In heaven once more to meet again their own poor "Little Jim."